Or, for a full page view via Tom TDB's Facebook process; click here. I've been avoiding posting info and discussion on the nuclear power plant meltdowns in Japan for three reasons; 1) the available information has been awfully crappy; 2) there's tons of discussion elsewhere for those who want it, and 3) it's depressing as hell, and who needs that right now. But; Nicole Foss over on The Automatic Earth posted a link today that I think you really have to see. This guy provides the hardest information available; analysed by an unquestioned expert from inside the nuclear power industry; in a very clear and calm way. The expert is Arnold Gundersen. Just a bit of his info: "A former nuclear industry senior vice president, he earned his Bachelor's and Master's Degrees in nuclear engineering, holds a nuclear safety patent, and was a licensed reactor operator. During his nuclear industry career, Arnie managed and coordinated projects at 70-nuclear power plants around the country. " More résumé stuff here. He's been making videos for general information since the disaster started. But this one startled me; with critical information - which we are not hearing. Yes; it's worse than they're telling us; still. Watch, and listen. Then pass this on. Personally; I find it criminal that our own government is not telling us what they know; manifestly; they are not. up to TWO MILES away from the power plant. out of the air- in the continental USA. small atomic explosion in the spent fuel pool at #3.
enough for a "good" energy yield. We got clobbered with an even heavier snow two days after the last post. Now, 4 days later still; the snow is gone, and the daffodils, which looked pretty flat for a while- are on their way back. First upload I tried didn't work; we'll see if this does- ah; barely. Wow, really lousy quality! But, you can see it. I may try to get a better version up; but - I've already tried 4 different ways. It takes time for the daffs to come back. They're not finished with the recovery process. But- in another day or so, you'll never know the snow ever happened. It always snows on the daffodils. Except; it doesn't, anymore. I used to be fond of reciting that line; "it always snows on the daffodils" - as yet another bit of spring tonic. When we first moved here, and for the next 15 years, this was really true. It was a standard part of the progress of seasons, along with the "January thaw". You could count on it; snow would melt, mostly in March; April would arrive with a few surviving drifts still around, flowers would emerge- and then; cold-snap, and a really good snowstorm. So, I was always fond of the snow on the daffodils. 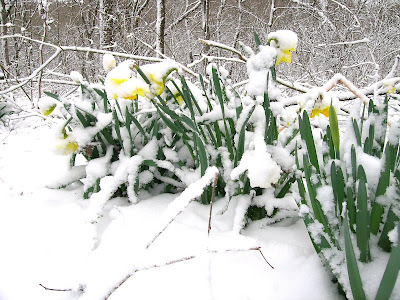 It always gave me the chance to make the superior observation that of course it snowed on the daffodils, it always snowed on the daffodils, it always had snowed on the daffodils and always would snow on the daffodils - so-- why not just relax and enjoy it. Since it's going to be melted and gone by tomorrow anyway? Then about 15 years ago, it quit snowing on the daffodils. I felt bereft. So you can imagine my joy today. Part of the joy is knowing, from all the years of watching, that the daffodils are totally up for it. Sure, they're closed, and bent down, and look like they're being squashed; but in fact it's all part of their normal repertoire, and in two days they'll be all straightened up, wide open, and as cheerful as they ever are. Part of it, too, is the inevitable feeling- if they can take it- so can we. Iceland Launches New "Piece Corps"
Iceland today has announced that they are sending aid to both the European Union and the USA, in the form of a new "Piece Corps". Finding themselves with hundreds of unemployed well educated and reasonably well behaved youth, it dawned on them that Iceland is uniquely well placed to be providing desperately needed help and advice to other countries suffering from financial collapse. Icelandic couch-potato youngsters have by now watched countless hours of financial pundits explaining what happened to them, and having nothing better to do, and wanting to "getoffadisrock" as they say in Icelandic; they have proven eager to volunteer for this new humanitarian adventure. "Look", Ingrid Ingridsdottir explained, "We've, like, survived it. And when we read the financial news coming out of the ashes of the European Union, and from behind the barricades at the US Federal Reserve - any one of us obviously has a much clearer idea of what's actually going on than any of those dimdims. We just hate to see them suffer." Starting in mid-April, flotillas of geo-thermal powered kayaks will begin carrying hundreds of eager, blond, idealistic semi-virgin volunteers to the financial centers of the Big 8. The first group is expected to reach New York by April 22, and a second wave is being launched to arrive in Washington DC just a few days later. London and Belfast are on the list, but dates are uncertain. The volunteers heading for Washington include a second kind of Piece Corps volunteer; engineering students. "As everyone knows, Iceland is the center of the world for real geo-thermal power development." said Ingridsdatsun Ingridsdottirdottirson. "We've been monitoring the thermal signatures of the entire Earth for some years now. The satellite data is absolutely clear; somewhere in the vicinity of Washington DC there is a new volcano erupting. The signature is much hotter than Kilauea in Hawai'i. True, all we can see so far is the immense atmospheric upwellings from the heated air; but that much hot air has to mean a real geothermal source someplace. With our Icelandic expertise, we're sure we can find the source, and tap it. Judging from the satellite data, there's enough energy there to power the entire USA for the entire foreseeable future- no nukes needed." The entire world wishes these modern saints good luck. And- I don't know how I missed this when it first came out; but it's an appropriate follow-up to everything else.